This great update for employer is Courtesy of AILA’s Verification & Documentation Liaison Committee. On August 13, 2012, U.S. Citizenship and Immigration Services (USCIS) announced that employers should continue using the current version of the Form I-9 after the form’s expiration date of August 31, 2012. The current version of the Form I-9 has the expiration date of August 31, 2012 printed in the upper right corner and the revision date of August 7, 2009 printed in the lower right corner. Employers should use the current version of Form I-9, but the USCIS instructions for the Form I-9 state that the agency also accepts the prior version of the Form I-9, which bears a revision date of February 2, 2009. Previously, on March 27, 2012, USCIS published a proposed revision of the Form I-9 and accepted comments on the proposed form until May 29, 2012. The USCIS announcement instructing employers to continue to use the current form until further notice indicates that the agency will not publish a final revised Form I-9 before the expiration date of the current Form I-9. When hired for a new job, employees are required to prove that they are legally entitled to work in the United States. Employers are required to verify the identity and eligibility to work for all new employees. 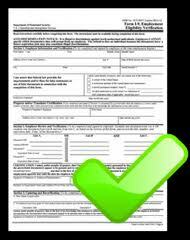 An Employment Eligibility Verification form (I-9 Form) must be completed and kept on file by the employer. In addition, employees must present original documents, not photocopies. The only exception is an employee may present a certified copy of a birth certificate. On the form, the employer must verify the employment eligibility and identity documents presented by the employee and record the document information on the I-9 form.